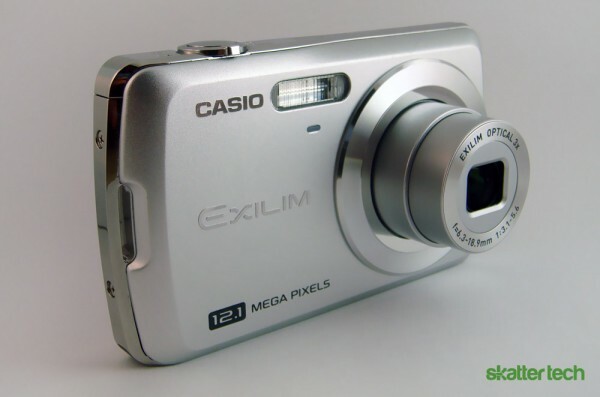 Casio announced earlier this year at PMA 2010 that their new EXILIM EX-Z35 would have ”intelligent automated features found in a slim and stylish compact design [that would allow] users to capture moments effortlessly.” Packed with automated features, this camera aims for ease of use. 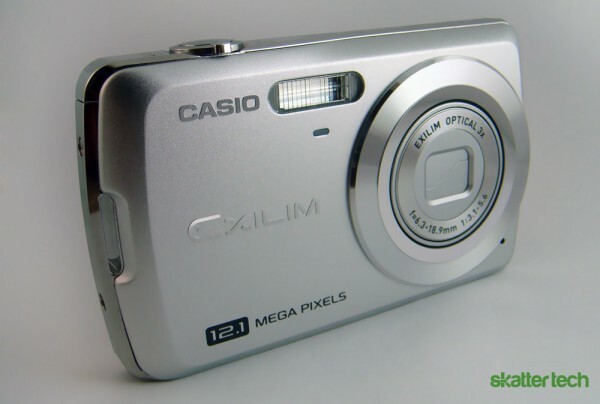 Coupled with an affordable price tag in the range of $100, this Casio stands to be a strong contender in the entry-level point-and-shoot market–especially among people not too technologically inclined. Does this Casio pull through with its promise of advanced features in an affordable package, or does this low price point mean it will under-perform? The thin, sleek design of the EX-Z35 is both stylish and practical for a point-and-shoot camera. The camera itself is mostly plastic, however, it feels solid without any gaps between panels. The satin finish is definitely a plus because it makes it less susceptible to fingerprints. In contrast to build quality, there were a few oddities in button placement. The lack of a dedicated macro button is annoying because it makes the user dig through a menu while there are two buttons capable of user-assigned secondary functions. 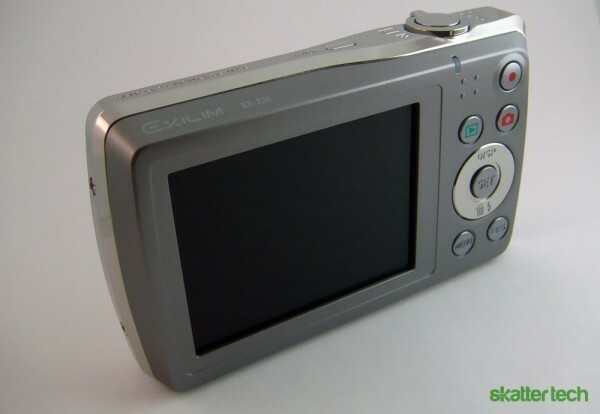 Meanwhile, video recording is counter-intuitive because the shutter button, which is traditionally used for both taking pictures and video, is used only for picture-taking on the EX-Z35. In YouTube mode, for example, I forgot about the dedicated button on the back and pressed the shutter release only to be notified by the camera that “Movie scene cannot be used for snapshots.” On the plus side, the Casio’s low button count and easily identifiable buttons means that it is quite user-friendly. Thus, I would say that ergonomically the camera is usable and only takes minor adjustments when shooting video or macro photographs. The EX-Z35 comes loaded with automated aids. Some of the most useful ones are face detection, Best Shot Mode, a dedicated YouTube movie mode, a dedicated eBay mode, and Easy Mode. The Easy mode, in my opinion, hit home as the most compelling feature for the given market segment. When enabled, this option prevents the user from accessing specific shooting modes and highly simplifies standard menus. The only accessible menu in Easy Mode has settings for the flash, a self timer, image size, and turning Easy Mode off. This feature definitely has appeal within the market because it lowers the learning curve and prevents unintended changes, a definite selling point for those who are intimidated by technology or simply want worry-free snapping. Since key features of the Z35 are designed for inexperienced or first time digital camera users, I was pleasantly surprised to find out that Casio included program mode-like options such as ISO settings, exposure adjustment, manual focus, and autofocus region selection. This extra level of sophistication gives users the ability to change settings commonly associated with more expensive cameras. This means that beginners will have the opportunity to learn about photography first-hand by fiddling with exposure and ISO settings. Although the EX-Z35 has a 12.1 megapixel sensor and can save images up to 4000×3000 maximum resolution, the picture quality varies dramatically in different conditions. Pictures taken in sunny outdoor conditions were accurately exposed and noise free. Colors under these conditions looked accurate. As with most cameras, this Casio didn’t perform as well under low light situations without a flash. It produced grainy images that were heavily processed with the on-board noise reduction, which led to under-saturation and loss of detail. In darker situations, there tended to be a bluish glow on top of the noise. Another potential problem in low light is the lack of an autofocus illuminator; yet, short of complete darkness, I didn’t notice much difference in the camera’s focusing capabilities. These possible shortcomings are understandable considering the restrictions Casio had to design the camera in order to keep it affordable. Despite this, Casio still managed to incorporate the popular face detection feature. It performed well during testing, usually taking about a quarter to half-second in recognizing a subject. Using the built-in scene modes that matched the shooting conditions did little to improve the quality of the images. For example, when I used the eBay mode to take a picture of a watch, the camera fired the flash when I took the photograph. This led to an unattractive flash-lit scene with a dark background—the stereotypical eBay picture. Meanwhile, the landscape mode didn’t have any noticeable change on image results compared to the standard automatic settings. This was the general case with the other scene modes I tested out. However, what the modes did accomplish when shooting was apply the correct advanced settings such as focusing and ISO options. I noticed in the eBay mode that the camera switched to macro automatically and that shooting in landscape mode caused it to select the appropriate ISO for lower noise. This is important because having the correct settings selected on a camera is the basis for all good photographs. The Casio EX-Z35 camera is a decent all around camera. The camera yields good quality images once you take into account that it only costs $100 and is therefore likely being targeted at customers not looking to spend a lot of money such as teenagers and casual users rather than professional photographers. There are simple scene modes which make it easy for the average user to take good pictures. It is somewhat difficult to shoot when not in automatic mode, but this isn’t too much of a problem since most people don’t use the manual settings anyway. It would have been nice if the camera included social networking features, such as the ability to post pictures directly to Facebook, since the majority of users will likely be teenagers. Overall, though, the Casio EX-Z35 is a good camera and is great for those looking for an affordable camera.